It has been a crazy month around here - between buying a house, spending all our free time there to paint it, and graduating (!!! ), there has not been a ton of time to shop (or blog, for that matter). I did manage to find a few things for our upcoming trip to Ireland though (which unfortunately has now been delayed until tomorrow thanks to issues at JFK today). I ended up buying the raincoat from my post two weeks ago, and wore it when we went to Mumford and Sons last week, where it rained the whole show. I stayed warm and dry the whole time, so it was a good buy! I also bought a striped "tunic" top from Old Navy, which really fits me like a slightly longer regular top haha - with rewards I had saved up, it cost me nothing! It's a pretty cute top though - it runs slightly large, as I have it in a medium. 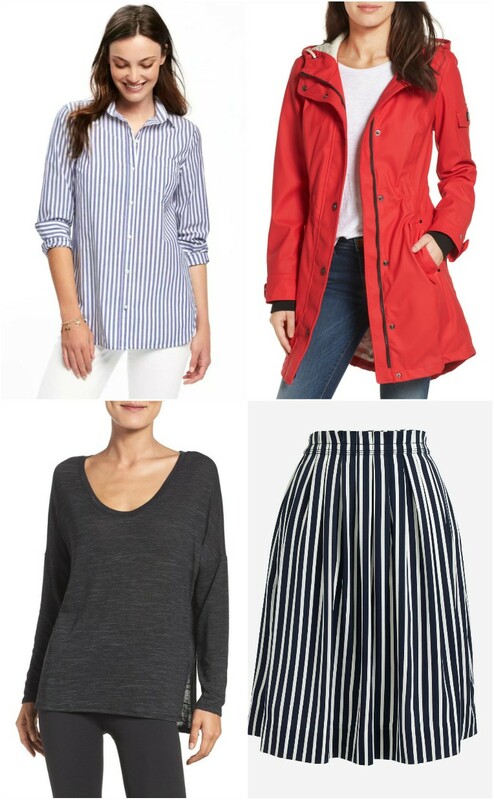 Last, I fell in love with J.Crew Factory's striped skirt that I've seen making the blog rounds (see it on Sarah and Katie here), so I finally made the navy version my own. As far as sponsored and c/o items, I received those short rubber boots for Ireland from Shopbop, and also worked with Finish Line on a recent post. I always pick out my own items, and loved adding a few new great items to my closet from my sponsors. This month, I really started thinking about if I really want to continue with my budget posts. I've been doing this budget series for five years now (this month is exactly my five year mark! ), and I think it's really served its purpose of getting my spending under control. Like I've said, I used to shop every single weekend, and spend all my disposable income on shopping. It was such a waste! This series as made me really think about what I buy and keep, and the direction I want my closet and money to take. I could spend so much more on clothing, especially because in the blogging world, to make money you have to spend it. But I like that I have stuck to my budget for all this time and not getting caught up in the world of buying buying buying just to blog about it. Instead, I have a closet of clothes I like, and money in savings and retirement funds instead. I also think about how starting in July, I will be in scrubs most of the time. I feel I won't be really shopping that much any more, so I don't know if you guys would be interested in hearing about the one new blouse I buy a month. On the other hand, I also think it's important to be open and transparent on here about spending and what I receive from sponsors - I sometimes feel that is missing a lot in blogging nowadays, and many of you have expressed the same. So I'm conflicted, and would love to hear your opinions. Do you still enjoy the budget posts (almost always my highest viewed post of the month) or are you feeling like it has ran its course and isn't necessary anymore. Anyway, enough about me. It's your turn!